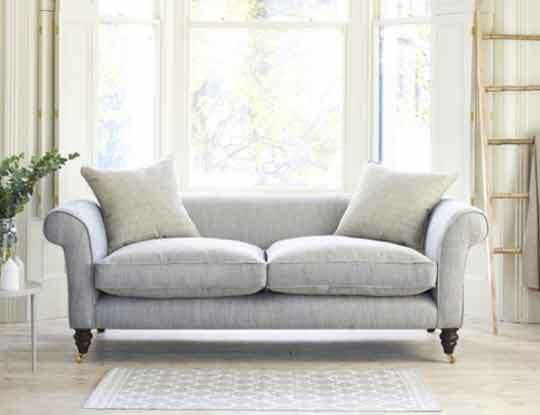 Buy online or pop in store to see our full collection of neutral beds, settees and chairs. Whether tones of beige, white or stone take your fancy, a subtle yet stylish Neutral sofa is an ideal choice for any interior. Can you picture your home with a crisp new comfy member to your home furniture, perhaps a beautiful neutral chesterfield sofa bursting at the seams with style and elegance, or perhaps a one of a kind stain-resistant neutral velvet sofa bed for all occasions. Sublime neutral corner sofas are perfect for family time or select a neutral armchair to complement your room, in a delicate stone hue, if you want something fresh and appealing. Customer who are looking for an edgy neutral sofa or even for a bit of a traditional style, there are an abundance of shades of fabrics to suit all interior tastes. All our handmade, British sofas can be upholstered in any colour tone and with expert advice available in both our showrooms and online you’re sure to find exactly what you’re looking for. Nothing says elegant style than a neural fabric upholstered on your favourite sofa. Imagine your home with crisp white walls, comfy carpet and that stunning neutral sofa surrounded by the TV and dining table...what an impressive site. At S&S we understand all about design, trends and styles. After all we have been designing furniture for over 30 years. Every one of our showrooms have dedicated interior design consultants who are there to guide you through every step of the sofa design process. Everything from choosing the right fabric, then selecting a shape you will love to come home to, and ultimately assisting you make a great decision that will give you a lifetime of happy memories. Book online or call a store now to book your free interior design consultation, you get a dedicated one hour slot. Don't worry there are no hard sales tactics, just good honest advice. So creating that perfect neutral couch, bed or chair has never been so easy. Why not order some free neutral fabric samples pack, so you can see the high quality fabrics we offer.